Moina thrives in ponds and reservoirs, but primarily inhabits temporary ponds or ditches. Moina is a genus that has the ability to survive in waters containing high salinity and other impurities, including salt pans. Moina are primarily found in ponds or ditches. The males are smaller than females and the period to reach reproductive maturity takes four to five days at 26 degrees Celsius. 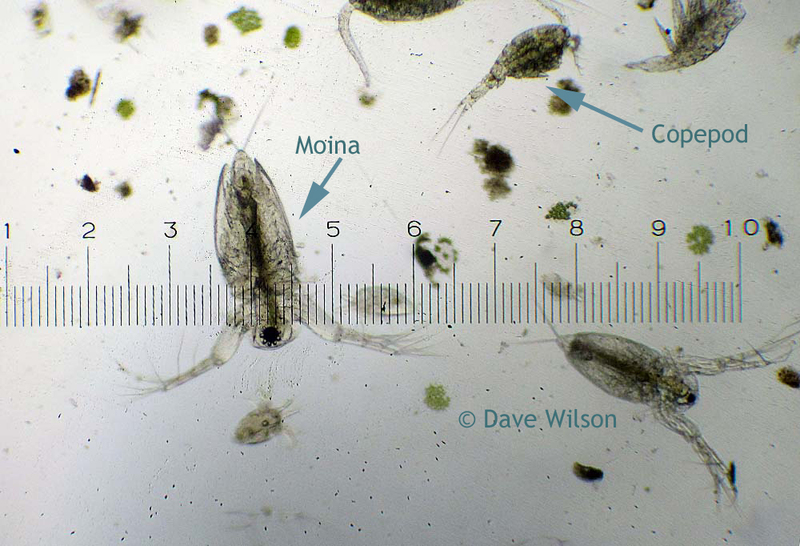 Moina and Copepod image courtesy of Dave Wilson. The image above was captured with a biological microscope. The Moina and Copepod were captured in Australia by one of Microscope World's customers. Copepods are a group of small crustaceans found in the sea and nearly every freshwater habitat. Some species are planktonic (drifting in sea waters) and some are benthic (living on the ocean floor), while some may live in wet terrestrial places such as swamps, under leaf fall in wet forests, bogs, springs, ponds, damp moss or water-filled recesses of plants. Copepods are sometimes used as bioindicators.